When it comes to survival tools, it is not just about the best multi tools or best knife, it also includes the best survival shovel. A shovel can be as useful as your other tools especially when you are outdoors hence for most campers, having a camping shovel is a must. A shovel can be used not only outdoors or when camping but can be useful as well when you are picking your way through ice, when removing snow from your car’s top or just for digging. Click here for the Best Survival Shovel available in 2016! Click here to read from 50 customer reviews! Click here to read from 162 customer reviews! Click here to read from 394 customer reviews! Click here to read from 119 customer reviews! Click here to read from 17 customer reviews! Let us take a look at some of the best survival shovels that you can find in the market today. Rated 4.9 out of 5 stars from 38 customers. Click the image for prices and reviews! For some outdoor aficionados, a multi tool or a neck knife is enough to keep them alive and well but for the more seasoned ones, bringing in a survival shovel is also a good way to survive any challenges. With that being said, what is the best survival shovel that anyone can bring in their next outdoor journey? 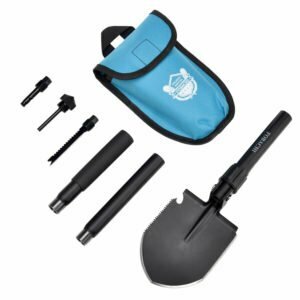 For less than $100 (click here for the price), the FiveJoy Backcountry Shovel is one of the brands I have in mind. This survival shovel is very compact and light. It only has a length of 47.8cm with its blade at 14cm. the width of the blade is 11.5cm and the thickness of .2cm. This survival shovel just weighs .64 kg so there is no reason for anyone not to bring it. Survival shovels has a lot to offer especially for backpackers, campers and hikers. It can do basic stuff and can be used as a shovel, axe, saw, hammer, rescue knife and a hoe. Most survival shovel can also be used as wire cutter, bottle opener, whistle glass breaker and a fire starter. The FiveJoy Backcountry Shovel offers all of these functions with its solidly built carbon steel that was treated with heat for optimum durability. The handle of this survival shovel was also ergonomically designed for easier handling and grip. With its handle design, controlling and leveraging with this shovel is easier even if you are wearing a glove. This shovel also comes with unique lock structure hence with a twist of the handle, you can change the shovel head and turn it into an axe or a hoe. For its price and usage, this is the best survival shovel that you can now find under the $100 range. Rated 4.5 out of 5 stars from 15 customers. Click the image for prices and reviews! One survival shovel that you can always see in different survival shovel reviews is the Chinese Military Shovel Emergency Tools by WJQ. 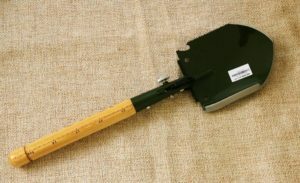 This is an affordable survival shovel with a price tag of under $100 (click here for the price). This is the ultimate survival shovel that any camper can bring because it can do 18 functions. Like a multi tool, this shovel can be turned from one tool to another such as a tool for digging, sawing, chopping, cutting, picking and prying. It can be used as well for hammering, bottle opening, can opening, wire cutting, climbing, measuring, shoveling and as a Mini Shield. This shovel has a dimension of 2.6 x 6.4 x 15.75 inches and weighs 2.9 pounds. The edge of this shovel is thick but can definitely cut and chop woods. This comes with a folding lock to keep it safe and a carry bag to make it easier to carry and transport. Rated 4.7 out of 5 stars from 381 customers. Click the image for prices and reviews! 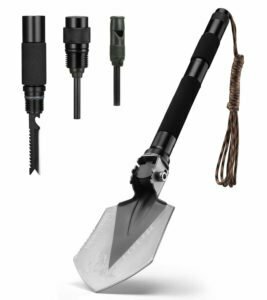 For the best survival shovel from AMES, the US GI Military Original Issue E-Tool Entrenching Shovel is the best that you can get. This survival shovel can be yours for more than $50 and it comes with steel blade and aluminum handle. This is a genuine military survival shovel issue that is now made available for public and private collectors. This survival shovel has a black powder coat finish and can be folded thrice to make transportation and carrying easier. 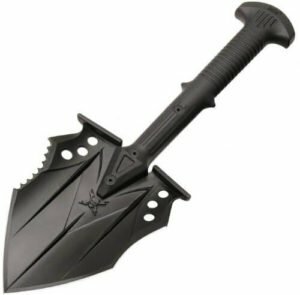 This tactical shovel can be turned into a saw, axe, mattock, or shovel, is collapsible and is made of very durable steel blade. When folded, this is just 9 inches long and when fully extended, it is 24 inches. This weighs 2.8 pounds and for its price, it is one of the best survival shovels that you can find in the market today. Rated 4.7 out of 5 stars from 157 customers. Click the image for prices and reviews! 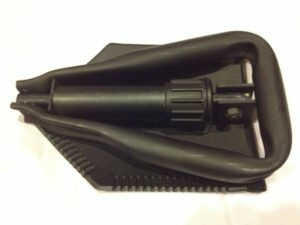 What is the best survival shovel that you can get for less than $50? 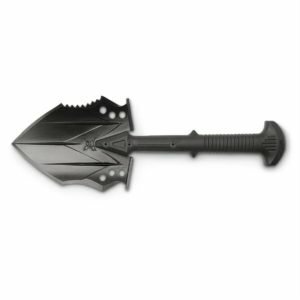 The Kommando Tactical Survival Shovel from United Cutlery is my best when it comes to affordable survival shovel. This survival shovel comes with an injection-molded nylon handle, proven for its durability and strength. The head of this shovel is made of tempered 2Cr13 stainless tool steel. For added strength, it is coated with black oxide. This survival shovel can be used for light chopping and can be used for defense in case an emergency arises. The sides of this shovel has been serrated and sharpened so it can be used for concave chopping. For this package, there is a nylon belt pouch as well. This shovel has a dimension of 16.2 x 10.6 x 3.6 inches and weighs 2.3 pounds. This is an import from China. Rated 4.5 out of 5 stars from 98 customers. Click the image for prices and reviews! The last item on our survival shovel reviews list is the Military Survival Folding Shovel by Fobachi. 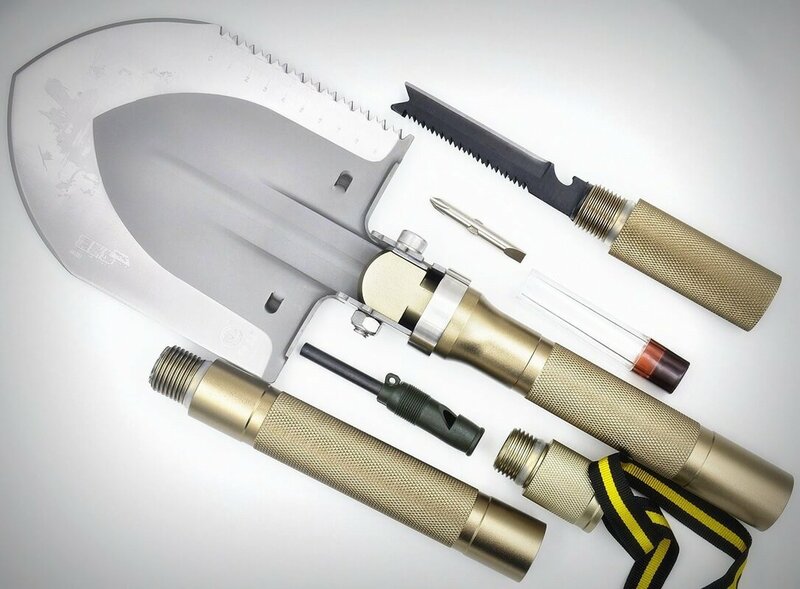 This survival shovel can be used for digging, sawing, chopping, cutting, picking and prying. It can be turned into some other tools as well and used for hammering, bottle opening, shoveling. This survival shovel is made of high-carbon steel body and steel handle. For this kit, it comes with extension pipe (can be added as needed), fire starter, whistle, life hammer and sawtooth knife. There is also a rubber grip handle and thickened spade. This survival shovel is foldable for easier transportation and it comes with carrying pouch. There is a loop added that can be attached to the pouch and to the belt or backpack. This is a replica of the original military issued e-tool entrenching shovel. This shovel works fine regardless if you use it for straight shoveling or on a 90 degree angle. This product has a dimension of 8.3 x 5.3 x 0.8 inches and weighs 1.5 pounds, one of the lightest survival shovel that you can find in the market today. What to consider when choosing a survival shovel? With a lot of survival and camping shovel brands out there today, picking up the best survival shovel can prove to be difficult. For this reason, here are the tips that we think can help you narrow down your options. Just like anything for survival, you have to look for a shovel that is made of durable materials. You will be using your shovel outdoors most of the time, probably all of the time hence it should be durable enough to withstand different harsh environmental conditions outside. The highly recommended shovel that you can find today is made of carbon steel. A versatile shovel is something that you can use in any given condition. It should be able to do simple jobs like removing snow from your car’s top or should function as a saw and do things like chopping. The best survival shovel that you can find is something that can do different tasks, like a multi tool. So there is a saying that with quality comes the price and this might be true for most products. However, there are products that doesn’t really cost high and yet show a lot of great quality. I would recommend reading survival shovel reviews to figure out which shovel is the best in terms of customer feedback, reviews, and manufacturer’s insight. These different survival shovel reviews can serve as your guide in finding the best survival shovel for your money. The best survival shovel to buy is always the one that fits your need plus some added bonus and features like being able to use it for other tasks. There is no need to spend hundreds of dollars just for a shovel, as long as you got a shovel of high quality, made from durable materials, solid and comfortable to use, then you are good to go. Do not get overwhelmed with brand names, look at what people is saying about it!